It's not every day that a review of your work gets you to thinking about why you are even doing this at all. The review by Jer over at Sleeping Bag Studios is one of those type of reviews. I agree with him on all of the points of accolade, but it was the questions he asked in the review that really got me thinking about how I can convey the complexity behind the concept in a way that people can connect with other than just listening to the music itself. There is questioning woven throughout the length of the review, but the following bit is particularly thought provoking. About a year ago I went to Tibet. It was my second time. The details of that trip belong somewhere else, but after that I came back and started writing songs. Sometimes with their own melodies, sometimes using familiar melodies. I wrote several to classic folk tunes. Woody Guthrie, Simon and Garfunkel. Some were and still are waiting for their melody. It was all just fun. Just spontaneous compositions. Then Christmas of 2015 I wrote the lyrics to "Rudolph the Bodhisattva." Over the next several months I continued to write more songs, and many of them happened to follow the lyrics of Christmas melodies. I have about seventeen songs now that are composed to Christmas melodies. So one of the reasons I chose to start with them is simply from the practical point that they collectively are consistently themed enough to create an entire concept album eventually. That is not the only reason however; actually, there is a much deeper reason which I think I will blog about over a series of posts, but I can tell you that it spans from my childhood, to life in a Theravada Thai forest monastery, to His Holiness the Dali Lama, to my current practice in Vajrayana and beyond. BuddhistChannel.tv has recently posted an article about this project. This is great news as they are a highly ranked web site and drive lots of traffic via Google search results! Fantastic news. Please take a moment to read the release. If you have heard the song, and enjoy the music, please share and spread the word. This project needs support to succeed! Thank you. A very nice write up and mention by Buddhistdoor Global on their Facebook page. Please read the post below. Like and Share! Video Featuring The First Nidana is now available on YouTube. There is now a video featuring the song "The First Nidana" available on the Carol of the Dharma Bells YouTube channel. If you haven't already please subscribe to the channel by visiting here. The video is posted below for you to see. This @Jamsphere review captures the heart of the song! The First Nidana has just been reviewed by Jamsphere Magazine an independent music magazine focusing on new and upcoming artists and musicians, and the words they write truly capture the heart of the song. Check out the full review directly on the Jamsphere website and if you haven't already done so, please support this project by sharing this site or a link directly to the song on Facebook, Twitter or any of your social media channels. "...it would be hard to deny that Ryan C Hunt’s lyrics and Lydia Salnikova’s voice, together with the lush piano-driven arrangement, conjures complex, emotional nuance in an unpretentious, natural way that can catch a listener off-guard in a moment of vulnerability or reflection." ​This idea is really at the core of the Dharma Carols initiative. World leaders like Bishop Tutu, His Holiness The Dalai Lama and Thich Nhat Hanh, are all advocates of advancing dialog between religious traditions and communities and finding not just the areas of similarity, but also finding ways to celebrate and rejoice in each others differences, and to share in the happiness of others as they explore their unique method of interacting with the divine. I am releasing a new section for this website. The overview of the effort can be read in the lessons tab above. The basic idea is that every two weeks or so while this project lasts I will release a new lesson plan designed to help parents or caregivers use the songs in this cycle as teaching aids. These are the same lesson plans that I myself will be using with my own children, and hope that by publishing them here others will be able to benefit from them. Feel free to use these plans as is, or simply to use them to help generate ideas for your own interactions. I would love to hear any comments or suggestions for additional ideas. Feel free to leave comments below. The First Nidana is now on iTunes! Looks like the First Nidana is now available on the iTunes Music Store and Apple Music for purchase as for listening. This is a great opportunity to support music and diversity. the First Nidana is a poetic rendition of the Buddha Shakyamuni's teaching on dependent origination, the Paticcasamuppada. In this sutra there are twelve basic causes that form the foundation for the next in order, and all twelve collectively form the basis for Dukkha, or the quality of unsatisfactoriness in this life. The song is set to the melody of the First Noel, and features the beautiful vocals and piano of Lydia Salnikova. OCTOBER 1, 2016 (HONG KONG, HONG KONG) – Ryan C Hunt is creating an album of Christmas music specifically written for Buddhists, Carol of the (Dharma) Bells. The first song on that album, The First Nidana (featuring Lydia Salnikova), has just been released on CBBaby.com and is available for immediate download there and at the website: carolofthedharmabells.com for $1 USD. It will be available on digital distribution sites like iTunes, Amazon and Spotify soon. Additionally, the full album can be pre-ordered directly on the website carolofthedharmabells.com for $10 USD. All of the songs targeted for release on the album will be set to classic melodies of popular Christmas carols sung and played in Western countries. 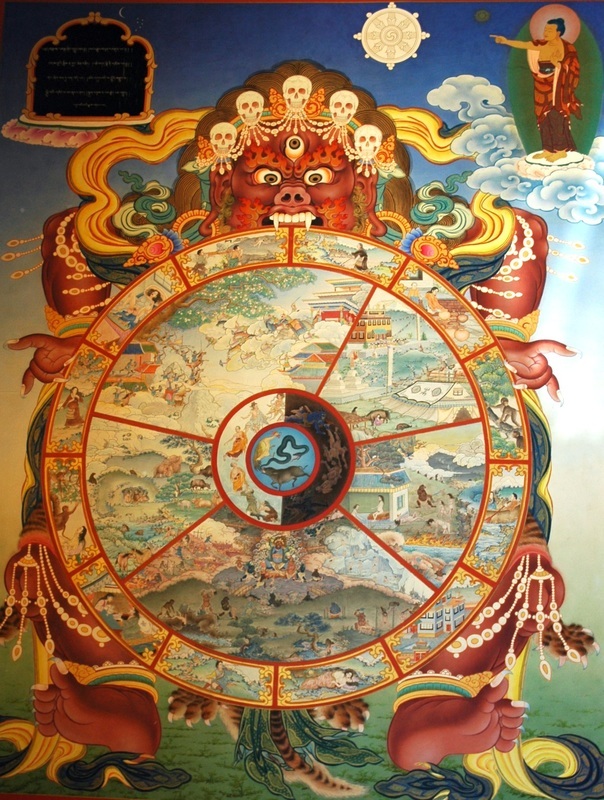 The music is in English with the occasional Sanskrit, Pali, or Tibetan word when appropriate. Set to the melody of the classic Christmas carol, The First Noel, The First Nidana, is a poetic rendition of the casual links explained in the Buddhist teaching on Dependent Origination. The piano and melody should be instantly recognizable to those familiar with The First Noel. The song is intended to be enjoyable to listeners of all ages, fun to listen to and sing, and can be used by parents as a tool to familiarize their children with the classic teaching. American by birth, Ryan currently lives in Hong Kong with his family, holds a regular job and commutes every day by MTR (the local rail system). Hong Kong is a city that bridges many people, cultures and religions. Ryan has worked in Technology his entire professional life, but actually got his degree in Fine Art from the University of Hawaii. Raised Christian and practicing Buddhism for more than 20 years his life is filled with many bridges of juxtaposing perspectives. Latest news about the album and the production process of the songs.